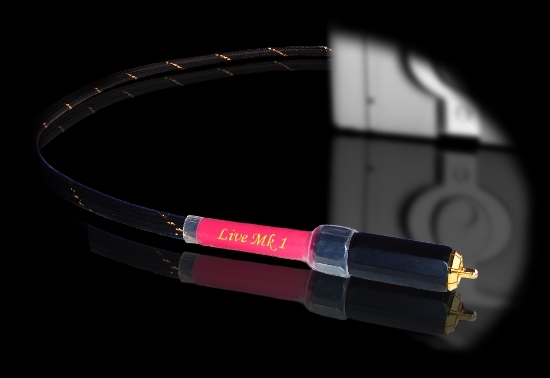 The Live Mk 1 - High Performance Audio Interconnect is an absolute superior cable when it comes to accurate and time coherent transfer of the audio signal. For this reason the Live Mk 1 - High Performance Audio Interconnect was engineered according to highest standards using proprietary Total Signal Integrity Design (TSID). The specific, and often overlooked, characteristics and requirements of the line-level (interconnect) signal have been fully leveraged in this unique interconnect cable. We spared no resources and our strenuous Total Signal Integrity Design (TSID) approach paid off. With high precision tooling, an absolute superior cable when it comes to accurate and time coherent transfer of the audio signal was engineered. Live Mk 1 - High Performance Audio Interconnect use a state of the art high precision nitrogen injected dielectric, which has better dielectric properties than even pure Teflon. Additionally, the cable capacitance is very low. These are the sigle most important factors to avoid time-smear and keep accuracy and time coherency in the audio signal. Finally, the interconnect is engineered to have low resistance and a conductor thickness optimised to avoid high frequency roll-off and overal signal loss. To protect the signal from external interference, Live Mk 1 - High Performance Audio Interconnect use a tight braided shield that is engineered to provide 100% protection against the most common hi-fi related interferences, e.g. transformer and power cord induced hum etc. However, to obtain the best shielding and EMI/RFI protection an often overlooked and even more important factor is the shield conductivity (lack of resistance). For this reason an extra thick high quality copper braid with very good conductivity is used. In our engineering process we tested several commercially available RCA connects. However, we found that they did not meet our high requirements and standards. Particularly the high resistance brass (bronze, nickel etc) material, found/hidden in the base of almost all available RCA connects, did severely degenerate the shielding and interference protection as well as the audio signal itself. To great cost and work we are now able to offer a locking, Teflon isolated, 24k gold extrusion tellurium RCA with superior and proprietary high conductivity and internal construction, leading to substantially better signal transfer and interference protection. Interested to know more about our speaker cables? "[Live Mk 1 - interconnect cable] has among the most well-built RCA contact we'd seen, comparable with the luxurious WBT and Furutech"